Azul the largest airline in Brazil by the number of destinations and departures, announced last week its preliminary traffic results for February 2018. Passenger traffic (RPKs) increased 16.3% compared to February 2017 on a capacity increase (ASKs) of 15.2%. As a result, load factor was 80.1%, 0.8 percentage points higher than in the same period last year. Year to date we continue to be the number one on-time airline in Brazil, with an on-time arrival rate of 86.08% according to FlightStats. 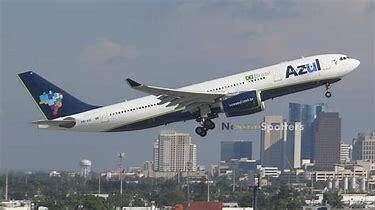 Azul S.A. (B3: AZUL4, NYSE: AZUL), the largest airline in Brazil by the number of cities served, offers 766 daily flights to 104 destinations. With an operating fleet of 122 aircraft and more than 10,000 crewmembers, the company has a network of 223 non-stop routes as of December 31, 2017. Among other awards received in 2017, Azul was elected third best airline in the world by TripAdvisor Travelers' Choice and best low-cost carrier in South America for the seventh consecutive time by Skytrax. Azul also ranked as the most on-time airline in Brazil and most on-time low-cost carrier in the Americas in 2017 according to OAG's Punctuality League, the industry's most comprehensive annual ranking of on-time performance.